DVD Synopsis: As modern society is consumed by zombie carnage, four desperate survivors barricade themselves inside a shopping mall to battle the flesh-eating hordes of the undead. This is the ferocious horror classic, featuring landmark gore effects by Tom Savini, that remains one of the most important – and most controversial – horror films in history. When there's no more room in Hell, the dead will walk the earth. 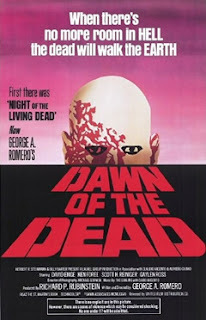 Dawn of the Dead, George Romero's follow-up to his now-classic 1968 horror opus, Night of the Living Dead, is an incredible film, one of those movies that you like a little more each time you see it, until the day you flat-out fall in love with every single scene. It's awesome in every way, right down to the tag-line: “When there's no more room in hell, the dead will walk the earth”. Just classic. The story follows four characters; a helicopter pilot (David Emge), a television news producer (Gaylen Ross), and two Philadelphia policemen (Ken Foree and Scott Reiniger), who steal a helicopter and head west out of the city, hoping to find a place that hasn't been overrun by the living dead. Low on fuel, they're forced to land on the roof of a suburban Pittsburgh shopping mall, which, despite the fact that it’s swarming with zombies, proves the perfect home away from home. Dawn of the Dead is undoubtedly George Romero's best film, a movie chock full of one incredible scene after another. There's the gunfight between the Philly police and a gang of thugs that spills into the halls of a tenement building, and quickly descends into a battle against a small army of walking dead. In another early sequence, when the four main protagonists land their helicopter at a refueling facility, they find themselves face-to-face with some more zombies, one of which loses the top of its head when it climbs onto some crates and gets a bit too close to the copter's rotating blades. Then there are the various scenes in the mall when the four are gathering up supplies, usually one step ahead of their deceased cohabitants (and sometimes, it's a damn short step at that). There's plenty of blood and gore in Dawn of the Dead, and also a bit of social commentary to go along with the fun (after living in the mall for several weeks, dining nightly on gourmet meals and taking advantage of everything their new "home" has to offer, the survivors get a bit restless. Sure, the world outside is falling apart, but a life of solitary, no matter how luxurious it may be, can prove an empty existence). In short, this film has it all. It wasn't my intention to gush like a fanboy while writing up my thoughts on Dawn of the Dead, but it simply couldn't be helped. You see, it's only been two and a half hours since I finished watching this incredible movie, and I still haven’t come down from the experience. Tom Savini effects king, this is the best zombie movie I have seen to date. Will check out the recommendation of freaks this weak, your "taste" in horror cinema hasn't let me down yet. ACheva: Thanks for the comment, and for checking out the blog. Couldn't agree with you more regarding Tom Savini; his effects for this film were phenomenal. And as much as I like NIGHT, I think DAWN has to be the quintessential zombie movie. Let me know what you think of FREAKS...It's a strange one (and I'm glad to hear I haven't let you down...hopefully, that streak will continue!). Day of the Dead comes close, but Dawn is definitely my favorite of the series. It defines the genre so well, and continues to do so. While I'd put NIGHT OF THE LIVING DEAD a close second (with DAY coming in a close third), I agree that DAWN is the defining film of the genre. I really enjoyed the 1978 version of Dawn of the Dead, and agree that it really helped establish the zombie genre - especially in the gore department - but i'm afraid that i'm partial to Zack Snyder's 2004 remake. @Klaus: I'm also a fan of Zack Snyder's take on this story, and will most certainly be covering that film as well some time in the future. But for me, nothing holds a candle to the original. It's my second favorite horror film of all time, and I have a great time EVERY time I watch this movie. After a whole bunch of viewings, it's lost none of it's appeal. Hey, we can't agree on everything, right? Thanks for the comment, and have a great day. I couldn't past this post up. Mentioned just today on the podcast was the question posed, which was better Zombie or Dawn of the Dead. For me, just like most of the hosts both are so close, but I would have to give the edge to Zombie. Just more scarier basically, such a great representation of Zombies. I don't want you to think that, that diminishes the creator Romero, with Night & Dawn, just in my opinion it edges it out slightly. Chaz: I can certainly understand your preference of ZOMBIE (as you know, Billchete absolutely agrees with you). It is an excellent zombie film, and the zombies themselves are particularly gross (much more so than Romero's). For me, it's very close, but Romero can do no wrong! (Well, let me rephrase that...Romero, when making a zombie film that was released prior to 1990, can do no wrong. Recently, he's done a little "wrong"!). I love this film's story, the way the movie flows as a whole, Ken Foree's excellent performance, and so much more. For me, it is, and most likely always will be, the standard all other zombie films must live up to. I'm definitely partial because DAWN OF THE DEAD is one of my favorite horror movies, so for me, it gets an edge over ZOMBIE. But ZOMBIE is a very, very good film as well. Thanks again for taking the time to comment. It's appreciated! DAWN OF THE DEAD is definitely one of the best horror films. And, to my way of thinking, it's Romero's finest movie. One thing that I've always noted about the movie and which few other people mention, is the frenetic opening. Even though the establishing shot concerns itself with a woman sleeping, I can think of no other movie that comes to light with such frantic power. You know from the first few minutes that everything is off the rails and that it's just going to get worse from there.